Hot Mama Ink's Mother's Milk Eco Friendly Maternity Tee is made of a unique blend of eco friendly fabrics that are garment washed for a super soft feel. 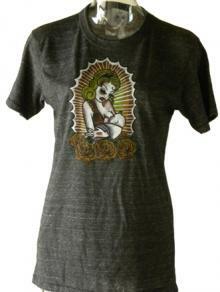 This Tee features graphics that were designed exclusively for Hot Mama Ink by well known tattoo artists. Support breastfeeding while being nice to the environment in this Hot Mama Ink Tee.